Zhengzhou? Where the hell is that? “Balls deep into China.” came the reply from my co-pilot Mike Wilson, an old China hand. Admittedly my knowledge of China beyond the huge landmass that it occupies, and Peking Duck was pretty ignorant. The nearest I had ever ventured was Hong Kong. A quick Google Maps revealed slightly more information. Yes it certainly was right in the middle of China, and it looked to be a fairly significant City in Central Henan Province. I wrongly assumed the airshow would be at the main Zhengzhou Xinzheng International Airport - ZHCC, and fired up Sky Vector for a quick look at viable routing from Chiang Mai. The first thing that struck me apart from the distance from Chiang Mai – circa 1,400 Nm, were the significant winds, 50-80 knots at my cruising level of FL260-270 as we progressed North and edged ever nearer the Jetstream. An intermediate stop was going to be required regardless, and obviously since this would be the first port of entry CIQ would be a prerequisite. 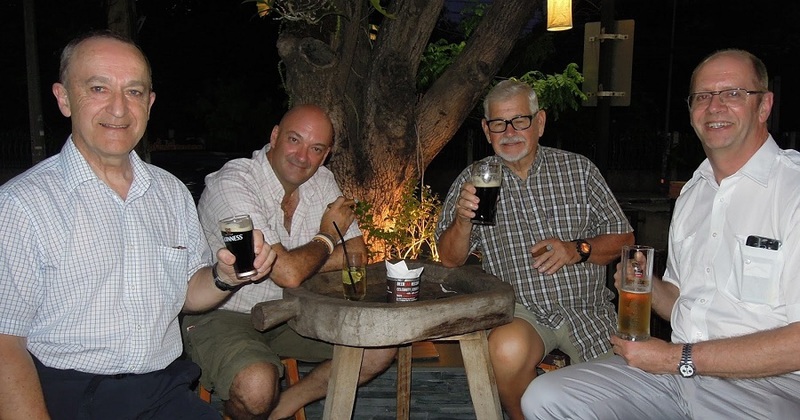 Having read the AOPA UK news that they were planning a fly in for foreign GA to the 2017 Zhengzhou Airshow transiting through my back yard in Thailand, I was excited at the possibility of joining the trip. I contacted Martin Robinson CEO of AOPA UK and he confirmed that it would be possible for me to tag along. 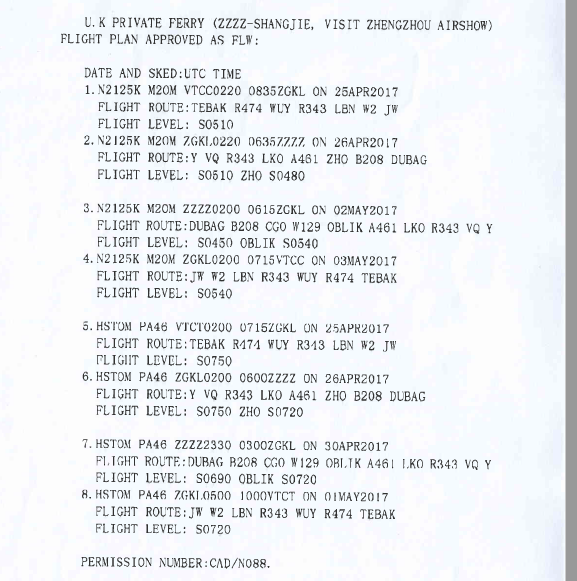 Another surprise came when we discovered that the airshow was not at the main airport but at a smaller, local airport called Shangjie Airport (no ICAO Code) which was a VFR airport some 40Nm Northwest of the main airport. This was starting to get interesting. 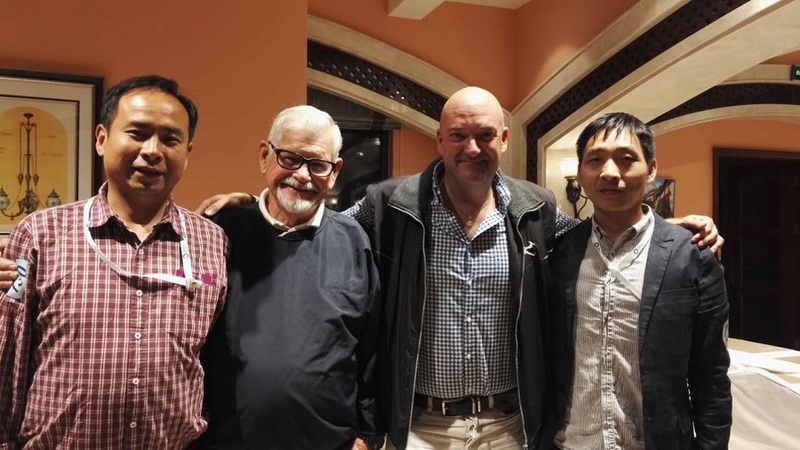 The organisers of the airshow – Blue Legend Airshow were powering behind the scenes to obtain the Chinese landing permits, and provide us the invitation paperwork to ease the visa process. They had also generously offered complimentary accommodation and fuel once we arrived at Shangjie. So far so good. Slowly but surely the list of hopeful attendee aircraft was pruned down for one reason or another to myself in HS-TOM my Jetprop and N2125K a Mooney M20M based in Switzerland. N2125K's blog is here. As we got into the detail several unexpected obstacles arose. The first was the initial refusal for me to operate at FL260-270. FL250 to FL290 was reserved for Military airspace we were told. The most we were originally offered was FL170. 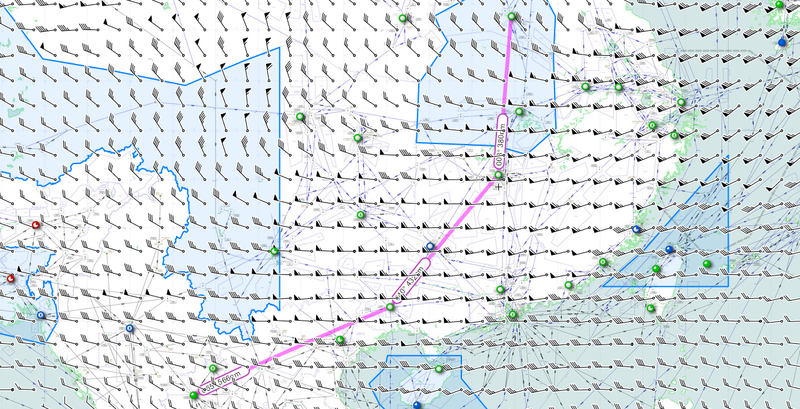 Acceptable for the Mooney, but severely handicapping my range, especially given the forecast winds. Turbine engines need thin air for best efficiency, as does my TAS. This led to discussions of a secondary intermediate stop, which revealed that handling price gouging has already found its way into China, making the trip economically unviable – bearing in mind that initially the costs to get to the airshow were the responsibility of the respective crews. A lot of email negotiation between both sets of crews, the organisers and AOPA UK ensued until we were able to find compromises – FL230 for me, and a cap on the handling costs underwritten by the organisers. The actual permit was not quite so straightforward for us, giving us split altitudes. The Mooney launched on schedule – fitted with long range tanks which gave it a very similar zero wind range of 1,300Nm as the Jetprop. ahead of the two crew. N2125K arrived at Chiang Mai Airport (VTCC) on April 20th 2017. Mike and I met Ben and Peter that evening for dinner. We immediately hit it off, with plenty of aviation banter, and BS flowed along with the beers. kindly flew up from Bangkok to help with the maintenance. weight and balance limits meant we had to bump Mike’s wife Harriet from the trip. Both aircraft departed 26th April a day later than planned. N2125K from Chiang Mai (VTCC) and HS-TOM from Chiang Rai – (VTCT). we were ready for top of descent so the altitude restrictions did not affect us. altitudes. The second was the majority of transmissions in Chinese. We were radar vectored into an ILS approach to ZGNN, and landed uneventfully. 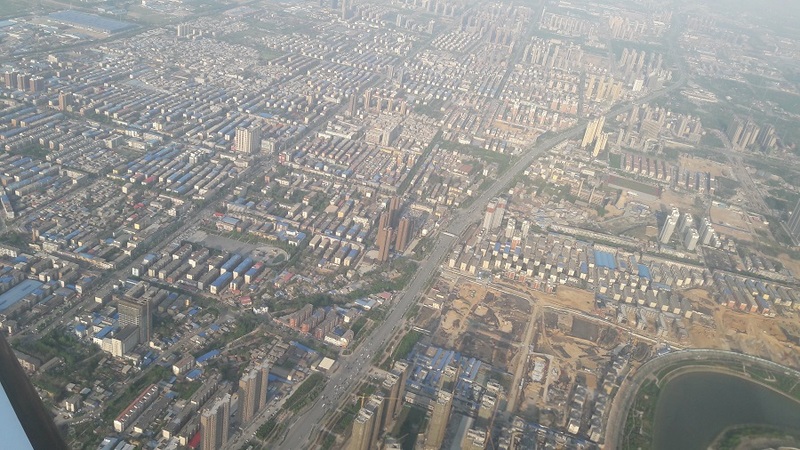 Nanning is a very prosperous looking city, with construction everywhere. Our hotel was very nice right in the middle of town and reasonably priced at around USD 60. 45 minuets, so reluctantly swapped that in place of the two hour Turtlepac. or for any other eventually especially given our tight arrival window. The flight from Nanning to the airshow was tense with our range concerns and ATC’s reluctance to clear us above FL210. losing any advantage the higher altitudes yielded. standby, we were allowed to remain high. and this is not RVSM. display could finish off and land. Our arrival was very warmly greeted by 'Sky' the boss of Blue Legend Airshow. The CEO of Blue Legend Airshow 'Sky' warmly greeted us. And we put on a little display of our own - (pose courtesy of Tom Claytor ) that became a big hit wherever we went. There was a lot of media interest, and apparently we were featured on National Chinese television. Link here. The airshow was co-funded by the local state government. There were 13 sets of aerobatic display teams, all but one foreign. The aircraft, some fifty plus had been freighted in and reassembled for the airshow. a P40 Warhawk of Chennault's Flying Tigers. 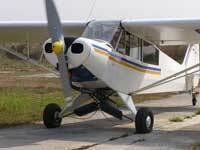 The static element of the airshow contained the by now ubiquitous Drones Rotax 912S powered. ...and an interesting Rotax 912S powered hover board. Shangjie Airport is also home to The Mooney Aircraft Company, who made a big fuss of N2125K and her crew, and rightly so. Their arrival marked a huge accomplishment, and testament to the longevity of these iconic aircraft. Ben and Peter were invited to describe their journey to the airshow. Their autographs were in high demand. We soon had the Mooney test pilots getting into the mood. We were treated like VIP’s and the hospitality of the local people both in and out of the airshow was very warm. We managed to take time out to visit the Shaolin Monastery. comprehend how they manage to organsie and keep everything running as efficiently as they appear to. The rich culture, ancient history is quite breathtaking. 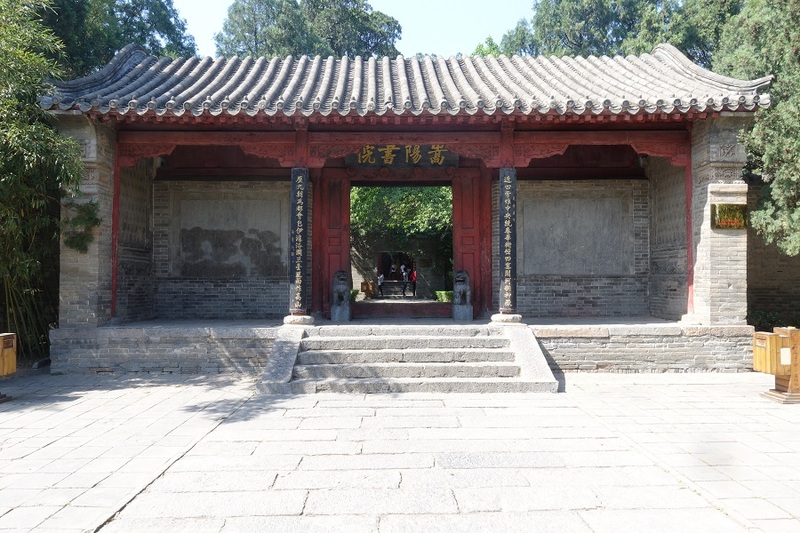 This is Confucius’ temple. and this Cypress tree in his courtyard is over 4,000 years old. Food was plentiful and very tasty. These dishes were all vegetarian and exquisite. day of our arrival. It was fascinating to hear how much activity and coordination had been involved with our flight. learning about the limitations of our aircraft and the fundamental differences between us and N2125K. Yang, far left is a senior aproach controller, and Yung, far right is the local tower controller. we spent the whole trip back 3 miles offset from the airways providing us with our own piece of airspace. but it was inspiring to be part of a process where the will to make something happen exceeded the obstacles preventing it. All credit to Blue Legend Airshow, AOPA UK, and the local government of Zhengzhou for all their determination. I would also like to pay tribute to Ben and Peter for making it all the way from Switzerland. Their blog is here. We have been invited to participate again next year, when apparently there will be a group of Earth Rounders aircraft joining.